The C7-generation Corvette may look way more high-tech and modern than any of its predecessors, but it’s still immediately recognizable as a Corvette. The Corvette’s signature DNA has managed to stick around since its inception, a fact pointed out by AmeriCarna in their new video comparing a 1968 C3 L88 racing Corvette and Corvette Racing’s C7.R. Besides the fact that they are both Corvettes and have V8s, these two iconic racers have little in common. Racecar’s from the L88’s era were simple things, with carbureted V8s, manual transmissions and basic suspension setups. The car featured in the video below has GM’s legendary 427 V8, a uncie M-22 “Rockcrusher” transmission and a barren interior with two seats, a steering wheel, all the necessary gauges and not much else. The C7, on the other hand, is chalk full of technology. It has a Pratt & Miller developed screen with a racecar recognition system, a 5.5-liter direct-injected V8, a six-speed XTrac sequential gearbox, a carbon-fiber racing seat and a high-tech steering wheel that looks more suited for an Le Mans prototype than a Corvette. But still, even considering all these differences, you’d never mistake either car for anything but a Corvette. 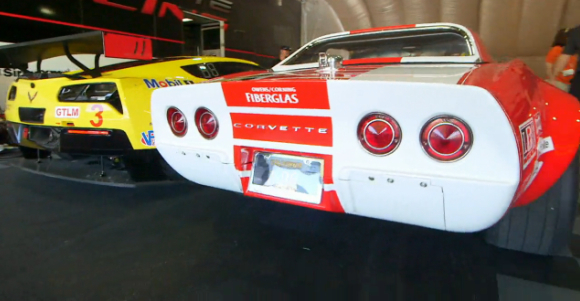 Check out AmeriCarna’s comparison of the two racing ‘Vettes in the video below. Previous story Poll: Is Cadillac’s Goal Of 500,000 Sales A Year By 2020 Attainable? Actually not the same horsepower. Prior to mid 70s horsepower was gross measured on a bare motor whle we now use net hp with engine complete with ancillaries.